a little bit of sunshine: How I became a barista and how it's like working as one. 1. I have to travel all the way to PJ on weekdays. 3. I was not guaranteed pay. The last one was the deal breaker. Being RA was enjoyable. I met new people who are as crazy minded as me and they share my enthusiasm for science but I'm not going to torture myself just to hang out with people I just met, however amazing they are. So I quit after a month. Au revoir. But before I quit, I already knew I will be bored doing nothing at home so I took the opportunity to look for jobs while at work. This I learnt from my co-worker who was browsing jobstreet.com during work hours. I was slightly better and scrolled though job websites during lunch break. None of the jobs from job search websites satisfied me. It then occur to me people like to post job vacancies in my residential community Facebook page! A quick search revealed a small cafe offering a job as a barista. A few Facebook messages and quick meet up later, I got the job! To me, it's another experience in learning something new and I'm very grateful for that. Learning new things is what I live for! So here's what I've learned! 1. Grind 9g of coffee. 2. Place coffee powder in portafilter. 4. Lock portafilter with coffee onto the espresso machine. 5. 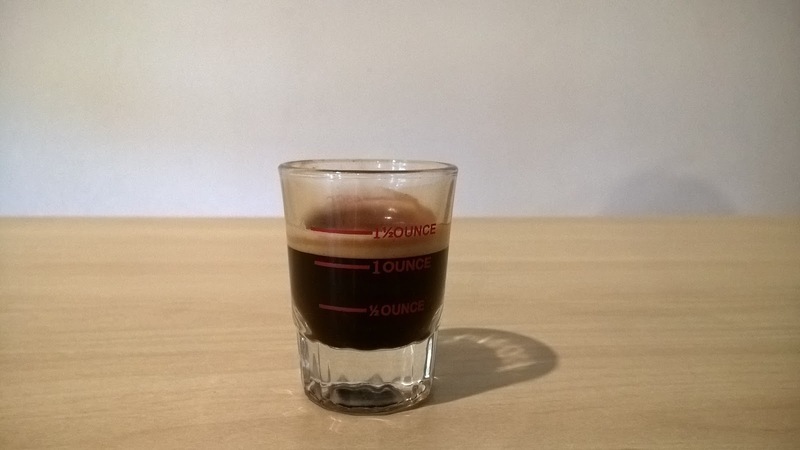 Pull a shot of espresso (or two when you used double the amount of coffee for long black). Long black (or Americano as some customer call it) is easy because it's two shots of espresso with hot water. But how about milk based drinks like latte and mocha? I have to learn to steam milk and that's where the challenge comes! I remember having palpitations during my first week of work, also my training week. I worried about wasting milk because I oversteamed the milk or created unsatisfactory foam. Milk which I destroyed can only be used in cooking and cannot be steamed again. Of course you can drink it but we are all lactose intolerant so most of the milk goes down the drain by the end of the day >.< But I got it within 2 days, to everyone's relieve. My boss especially because any milk that goes down the drain also means his money goes down the drain haha. 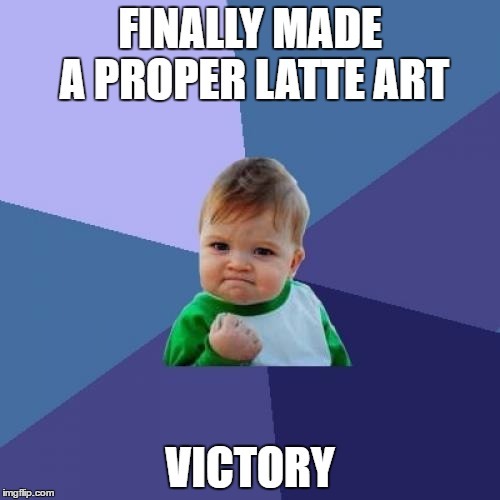 Because now I have to pour the milk and MAKE LATTE ART. I got even more nervous because not only am I wasting milk at this point of the training, I was also wasting the coffee and other powder of the drink I'm making (like green tea powder, chocolate powder and masala chai powder). I can never get the foam to flow out with the milk and I end up having to scoop the foam out and dotting the top of the drink with some foam. But I can't let my customers have such a hideous cup of coffee! So I swirled some foam around with the crema to achieve a sunburst effect. After watching many Youtube latte art videos, stalking professional baristas on Instagram and much practice on my super busy first Sunday, I finally manage to make a heart without fumbling. And other rudimentary success followed as well. Like my first fern like art. 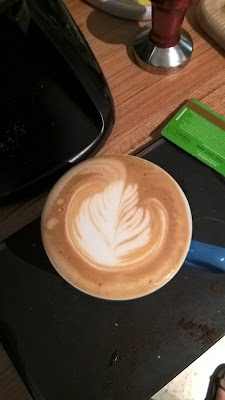 They look pretty similar o.O Notice how the outline of the design is not really defined because while my milk steaming is acceptable, it's not ideal and I ended up with less than perfect foam for pouring latte art. Once I got that down (phew! ), it's easy to forget about the other aspects of the drink. 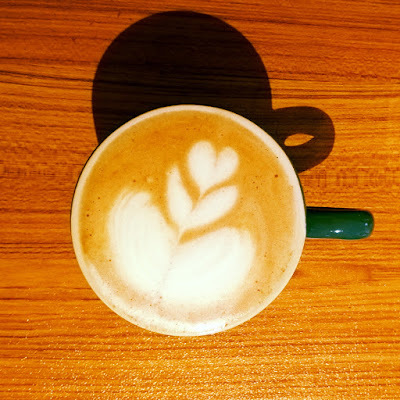 As a barista, pulling a shot and steaming milk is very much protocol and you kind of just put it at the back seat and concentrate more on making a beautiful cup of coffee but that's not what a good cup of coffee is all about. I forgot that. Luckily it was the beginning of my job, maybe the 2nd or 3rd week in. 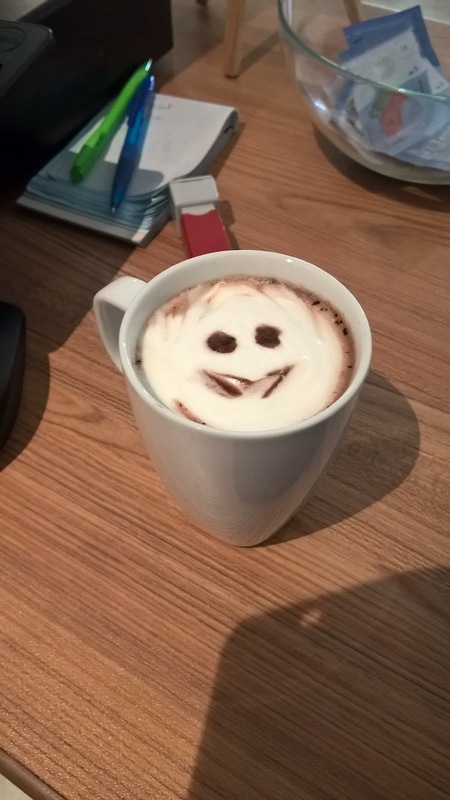 My boss was heading off somewhere and requested for a cup of cappucino. I made him one, topping it with a heart. He drive off and returned 10 minutes later, claiming my coffee as undrinkable. I was so obsessed with making more foam for the cappuccino I overheated the milk and it made the drink flat. He was late for his other commitments but made me practice and made few cups of coffee before he was satisfied before heading off again. I took a photo of it after he left haha. Notice how the foam looks smoother as it progresses? I was too obsessed with making foam for the first (far left) cup. There was a lot of foam initially and there was a nice heart art too but the foam was too unstable due to overheating and it deteriorated into that pile of... mess. 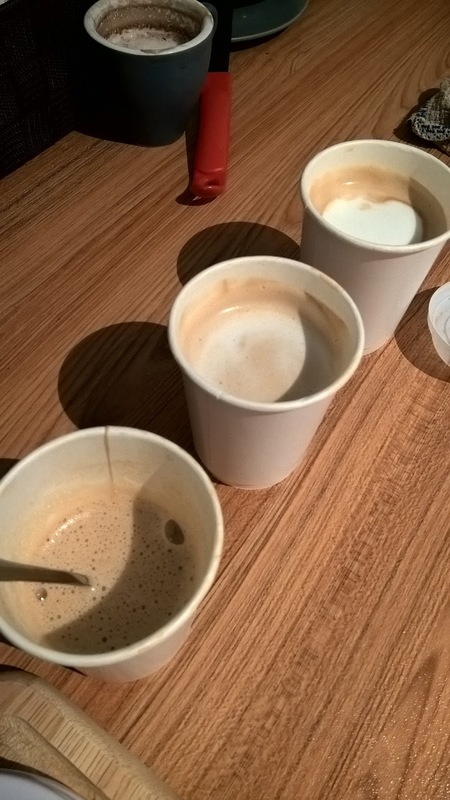 The last cup looks tempting because the foam is so silky smooth :) Feels like it can glide on your tongue to the back of your throat. Since then, I have progressed loads! Haha perasannya. Maybe not a lot but I was definitely way better after months of serving coffee to customers. 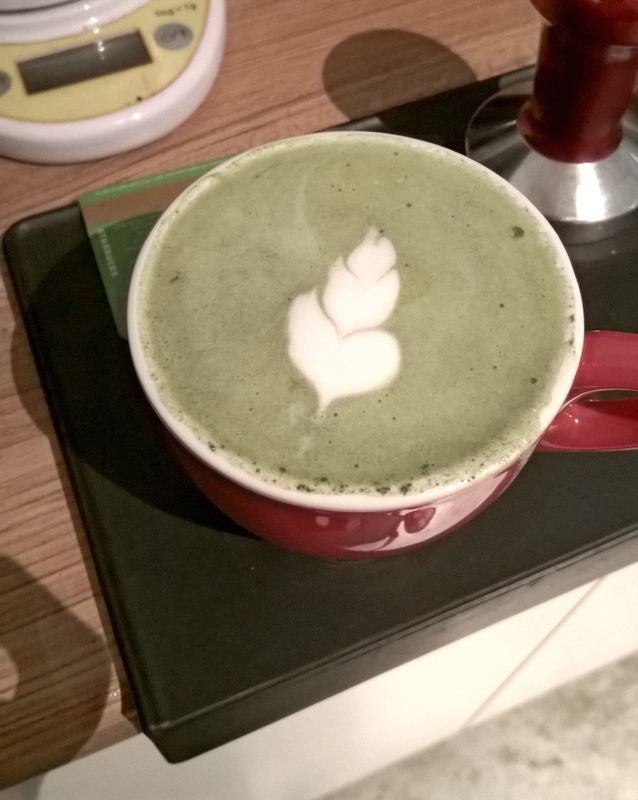 It was very satisfying to serve a good and pretty cup of coffee to my customers. 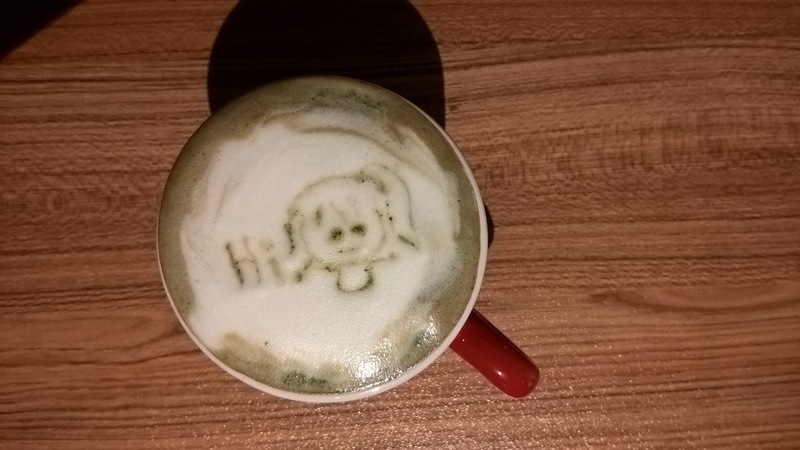 It also makes me so happy to see them remark on how cute the art is and looking at them take photos of the drink I just served them. The cafe I work for is frequented by young families, solo businessman and the occasional couples. For solo male businessman, I avoid serving them drinks with heart latte art on top because I'm afraid they will get the wrong message hahaha. Same goes to the guy when I'm serving couples. I don't want the girlfriend to think I'm subtly giving the guy some kind of message. Speaking of that reminded me of two couples I've served. Then another time I was serving this young couple, around my age. This time after I served the two of them, the girl commented to her boyfriend on why did she get such a simple art (the heart) whereas the guy got the complicated design. Girl, I'm not trying to hit on your boyfriend ok! My plan backfired on me for this particular case haha. Technically, this is consider latte etching because you draw on it rather than making purely with the milk foam. Making art this way is not ideal because the art won't lasts as long and the drink has cooled down considerably before you even serve it to the customers. But that's what makes it ideal for kids! When I serve the kids, they will first shout out, 'BEAR!/CAT!/etc' (depends on what I made) before destroying the art as soon as possible (after their parents took a photo). 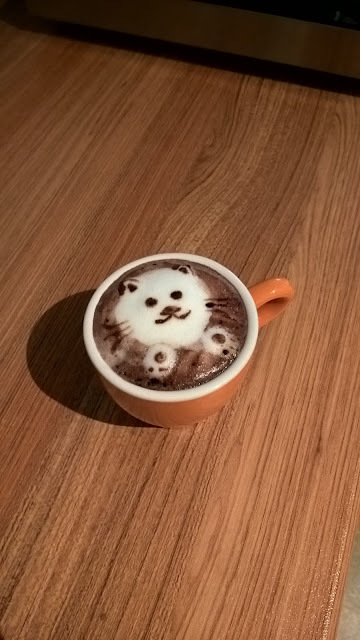 I usually make a bear but sadly I do not have a photo of a bear latte art :( Those must be made on busy days when I don't have time to take photos. And because it has cooled down, the kids can drink it immediately once I serve it. I'm entitled to one free drink per day (Thanks boss!). I don't usually exploit this work benefit of mine but when I do, I use the chance to experiment with latte art that I won't ever serve customers. Like this Chucky like latte art. It will give kids nightmares. Most of the time, I prefer to serve customers tulip because it looks more complicated than a simple heart but truthfully, it's easier to make because a heart needs to be symmetrical to look good whereas a tulip doesn't really need a perfect symmetry. Notice how later on my art becomes more defined and cleaner compared to when I first started. This is the difference of a better quality foam. 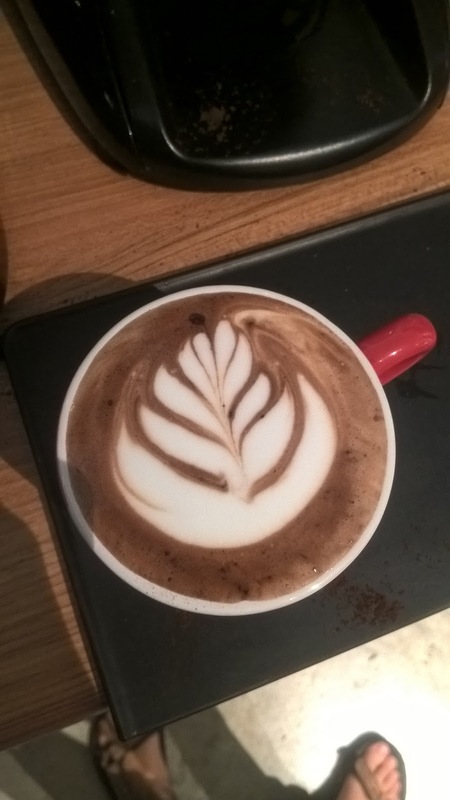 Also, I think this is mocha, my favourite drink to make latte art because it's darker than all the other drinks so the latte art really pops out. 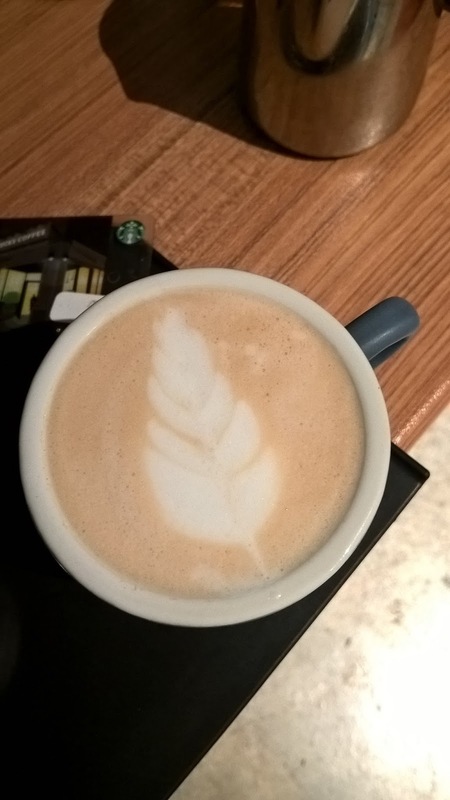 I only manage to master a rosetta towards my last week of work hahaha. How pathetic is that. But hey at least I did it woohoo! Digressing: The red shiny thing is a tamper, to flatten the coffee grind so that water can push through the closely packed coffee and extract coffee from it. Funny thing is even though I'm a barista, I can't tolerate coffee. Even a half cup of latte gave me palpitations and GIT reactions. Even my boss give me a weird eye when I told him I do not drink coffee when I first started work. He has his reasons to be worried. But when customers don't complain about my drinks and his regular customers still return to the shop after I served them, I guess he felt I'm competent enough la hahaha. Maybe that's why I'm more obsessed with the aesthetics of the drinks (as you can see my what I typed) rather than how it taste. All in all, I am grateful to have a chance to try something new in life. While some people opt to return to work in our own field (dentistry), my mentality is why not try something completely unrelated to my own field and learn something absolutely new? Overall, it's not an strenuous job and I enjoyed every second of it. I initially planned to work here till February because we have anticipated to get our dental jobs in February but when that did not happen, my boss willingly let me worked longer. Eventually I was made redundant at the end of March because I was travelling way too much for his liking hahaha. He needs someone to be around most of the time and I need to satisfy my wanderlust and thus ended my job as a barista. Till we meet again, espresso machines of the world. 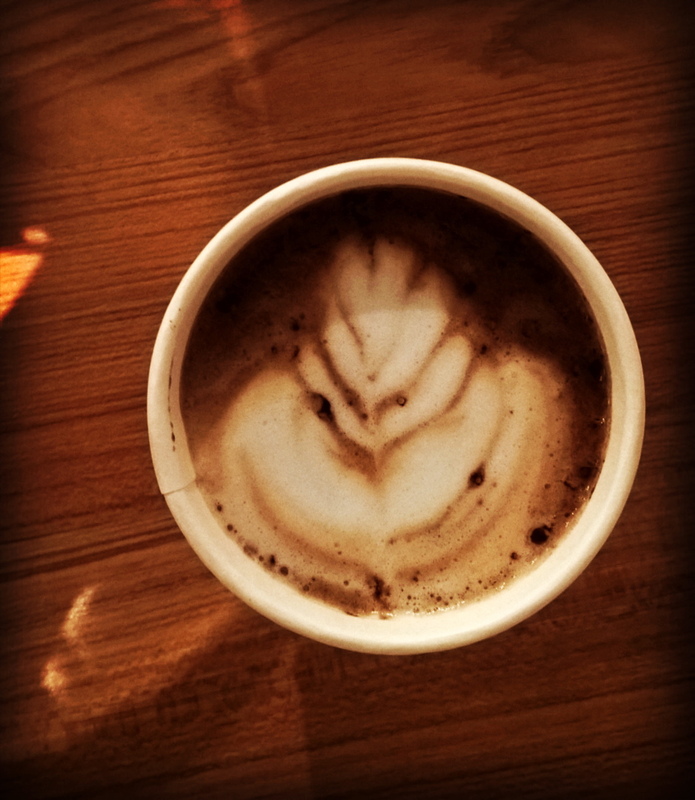 Hopefully my skills as a barista will come to good use, one day.